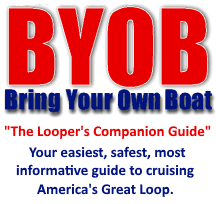 How many boaters have actually cruised the Great Loop? And who are they? sources. Based on information from ACE (Army Corp of Engineers) approximately 600 more recreational boaters a year pass "one way south"
they are indeed cruising the Loop or just heading south. 10-years. How many actually do? Only heaven knows, but for sure those numbers keep growing. year. For sure, this voyage is getting more popular each and every day as more people learn about it. that 19' 1" bridge was a 62 foot sailboat with it's mast down and a 57-foot trawler with their radar mast and Bimini top down. solo, and both of us normally meet at least one or two other solo Loopers each time around. 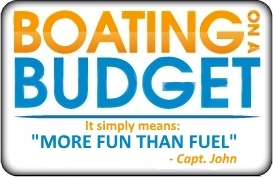 fees for the time he/she is not cruising. an under 30-foot vessel such as a Ranger Tug, Rosborough, or C-Dory will be my next vessel. shopping and charming waterfront attractions. pictures you take, you will be able to instantly send your photos to friends and family or post them on your Blog and FB page. together to provide you with a boat load of quintessential experiences. water in your very own boat. jet-skis, customized pontoon boats, open bow boats and center consoles. with fresh water, cooking appliances, sleeping quarters, refrigeration and marine toilets/shower facilities. Some vessels have central air & heat. Looper in a brand new Flagship vessel, the majority of Loopers are cruising in safe, suitable yet humble vessels purchased on the used market. even seen a Lock, Lift or Swing Bridge. In addition, most Loopers have never experienced anchoring out in tidal waters or strong river currents. Take notice in all the pictures, how close to shore we always are. Seriously, cruising AMERICA'S GREAT LOOP has to be the safest long-distance voyage on the planet. or comments. . . Thank you! It's not a question of not having enough money. . . It's a question of how you want to spend it. On more Fuel? - Or more Fun?